This is my year of keeping Christmas decorating simple, and the mantel is no exception. I want my house to feel cozy and inviting, but I also want to enjoy this time of year and not make myself crazy with decorating. I kept all of my usual accessories on top of the mantel, and just added greenery and lights. I had a couple of faux branches that I used on the ends, and I filled in the middle with cut roping from Costco. I was pretty loosey goosey with the lights… intertwining them through the lantern, ball jars and greenery. I did get some new stockings this year. I wanted something neutral and reasonably-priced since I needed 6 of them. I found these cable knit ones as JoAnn Fabrics for $10 each. Score! 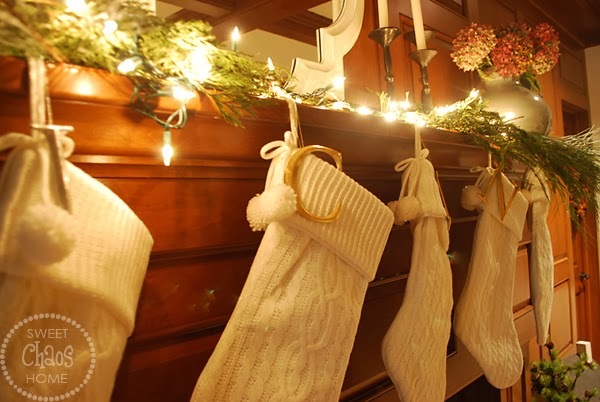 The stockings are "labeled" with lettered ornaments that I picked up a few years ago at Restoration Hardware. While I've been getting the inside of my house ready for Christmas, Mother Nature's been doing her part outside. Lots of snow out there, and the kids are on a 2 hour school delay this morning. It's the perfect day to sit by the fire! 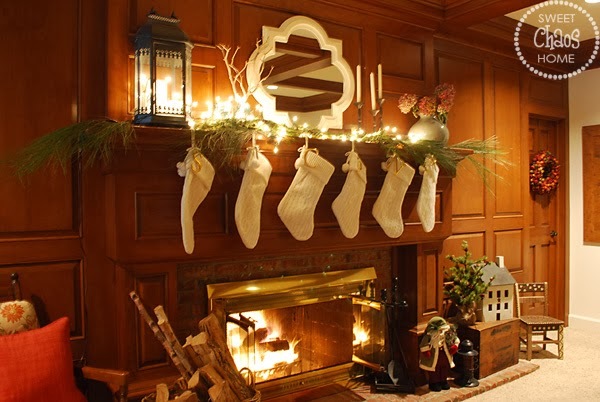 Your mantle is so pretty to begin with - I think your simple greens, lights and stockings are the perfect way to dress it for Christmas! Lovely, warm and cheery! I love this room. Looks so pretty and cozy! Your new stockings look great. I have similar ones and I wish I had bought those letters when RH had them. Can't find them anywhere now. 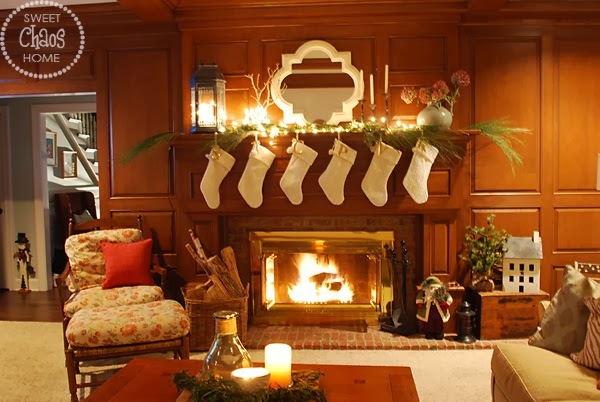 Hope you are enjoying the Christmas season in your beautiful home!